Volunteers tackling bank erosion in the Ecclesbourne Valley by spiling with living willow. A leading wildlife charity has announced it will fund new works to make the Ecclesbourne Valley more accessible to visitors. Derbyshire Wildlife Trust is putting £26,685 into the project, which brings together eight partners organisations and will start this month. Accessing Nature will see the restoration of 11 miles of existing footpath and the addition of five information panels and countless waymarkers to create a ramblers’ trail. Trust officer Kath Stapley, who is leading the project, said: “Derbyshire Wildlife Trust has been working with partners in the Ecclesbourne catchment for several years, making many improvements to the watercourses and surrounding habitats. The aim is to reconnect people to their natural environment, giving them a greater appreciation of this beautiful part of Derbyshire. The route will follow the river between Duffield and Wirksworth, and walkers will see wetlands, woodlands, hills, farmland and spectacular viewpoints. There will also be a diversion up to Alport Height, on National Trust land, offering great views and family picnics. 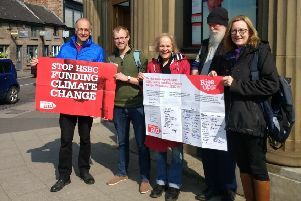 The SITA Trust contributed £14,415 to meet costs, while Wirksworth Town Council, Severn Trent Water, Banister Trust, Duffield Parish Council and the Environment Agency added a combined £12,270. To find out more about the project and the valley, visit www.derbyshirewildliftrust.org.uk.